TET ((Nicole's Plum Crazy x Nicole's After Glow) X Eenie Meenie Jellybeany) Ev. 32" scapes, 6 1/2" flowers, 5 way branching with 30 buds.Substance, size, and incredible scapes are three things that usually lack from showy blue eyed flowers. 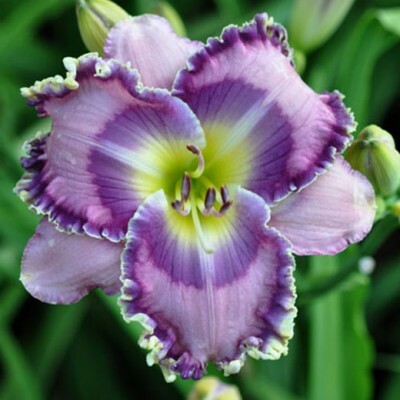 You don't very often find large, exceptionally branched and budded, with blue eyed flowers that hold up to perfection the entire day daylilies. I am thrilled to be introducing WHEN STARS ALIGN because it has been a great performer in every aspect that I want everyone to have this daylily. A heavy rebloomer. Fertile both ways.